Visitors to Stratford upon Avon approaching by car from the M40 enter the town via a one way system. Once past the multi story car park dead straight ahead is the Gower memorial to William Shakespeare. It features a sculpture of Shakespeare on a central pillar surrounded by four characters from his plays representing history (Prince Hal), comedy (Sir John Falstaff), tragedy (Lady Macbeth) and intellect or reason (Hamlet, Prince of Denmark). The fourth plinth could have been taken by Juliet to represent romance but the four characters chosen are amongst some of Shakespeare's creations. Strangely Shakespeare himself faces away from Stratford in the direction of Warwick. The North by North-Eastern night sky is poor for astronomy and only has brief glimpses of the planets and few notable stars. Possibly Shakespeare should be turned to face towards London where he ventured out from Stratford upon Avon off to earn his fame and fortune. That way he would have a fine view of the night sky and on a warm clear summer's evening he would be able to glimpse the Milky Way sweeping across the night sky. 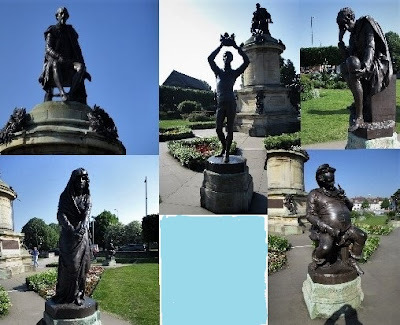 However, the Gower memorial is just another example of the many interesting things to do and see in Stratford upon Avon that are free to enjoy.